Drawing is thinking. Hand-eye coordination is essential not only to accurately render what you see, but to bring forth and execute what you see in your mind’s eye, i.e designing. I read once that we should use the word ‘draw’ as in ‘drawing information’, as from a well. To draw a building or space is to understand it, to make it our own –to impress it on our brain’s matrix. Photography, while wonderful and an art form in itself, leaves the lessons of buildings on the camera’s hard drive, not on ours. Not to mention the warmth and ‘tactability’ , as my friend Luisa says, of a sketch or a vignette, the volumes it adds to a presentation, the process it unveils. Revit has the capability to render photorealistic imagery, with incredible texture and lighting. But it is in the process that a project is appreciated in all its nuances, that poetry can happen, that the design and the architect eye, mind and hand can be sipped, like fine, expensive wine. Without process architecture becomes a shot of cheap wiskey, vulgar. Design, like diamonds, has no mercy… “They will show up the wearer if they can,” says one character in The Sandcastle, an early novel by the famous British author, Iris Murdoch. (I borrowed this bit on diamonds here). A drawing can be tuned to reveal and emphasize certain characteristics, and not others. It is a process of selection, of sharpening the way our brain takes notes of details. It is never alienating, never mindless, never automatic (unless as automatic art/ flow of consciousness), never repetitive, never listless as drawing on a computer can be. In the introduction of book Non-places: Introduction to an anthropology of supermodernity, Marc Augé mentions the many devices that, by keeping us ‘connected’ at all times, alienate and separate us from the place we physically occupy. Drawing keeps us grounded (in the here and now? ), and is an exercise in fully experiencing our surroundings, of mindfulness. And after the alarming The Shallows: This is Your Brain Online , on the ability to train our brain (and affect its physical make-up) by our daily habits, anything that can help with the collective scattered focus we are ‘learning’ from too much technology should be a worthwhile endeavor. 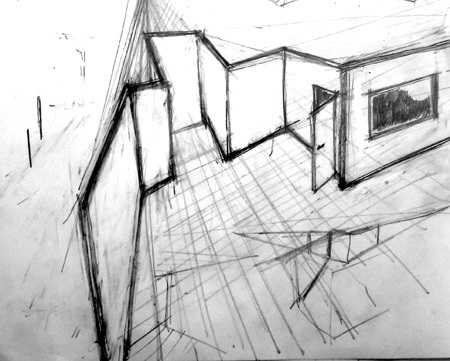 So yes, the Zen of Drawing, or drawing as meditation (architectural therapy not just art?). Like yoga, unplugging and plugging in at the same time. By drawing we fully inhabit this place, this body, as architect and artists. My blogfriend Suzanne Cabrera at [An] Open Sketchbook turned me onto Michael Nobbs, a Blogger/Artist into time management,who advocates drawing everyday. Here is his free, fun and inspiring e-book. I already started drawing loved objects before I ‘release’ them. And here, the first part on the importance of drawing.